I am doing a little producing again, and launching a Kickstarter project for my friend's directorial debut as well as the album premiere of the band we're working with. I met Tony and Stef several years ago when I helped produce a video about a cat in a hot tub! (It turns out that I'd actually met Tony while we both worked on Coraline as well.) They have a studio called Belly & Bones, and I love their work almost as much as their wonderful personalities! I'm honored to help these guys produce Tony's directorial debut, which Stef will art direct. It will be mostly animated, with an amazing puppet these guys have already developed for this dark and lovely song about destroying the past and guiltily building a future. And, to make matters even more awesome, the work we'll be doing is with and for a really great Portland band called Scrimshander! Andy and Peter make up the band, and they are also very delightful people who make great work. (They are the duo behind former band Bark, Hide and Horn.) I'm thrilled to be working with them. When they said they'd be producing their debut album, on vinyl no less, I thought it would be awesome for all of us to pool resources and make this Kickstarter campaign together for both the video and album. If you pledge to the project, we'll reward you with great music, art, and a host of funny updates and surprises, as well as our undying gratitude and affection! But the awesomest way you can help is to help get the word out! Tell your friends.Tell fans of music and traditional animation. Word of mouth is the best way for us to get funded, and sharing this project makes a difference that I appreciate immensely! In honor of my wonderful friend's birthday as well as the wonderful crop of seasonal peaches this year, I went on a peach spree this past week/end! Montea is no fool when it comes to good fruit, and peaches are probably her favorite of all time! But, she is also eating about the same as I am- grain-free, refined sugar-free, hippie and clean. So, some special birthday treats would take some doing. The flavor is just ridiculously awesome! The sour mixes so well with the peach, honey and cardamom. Making it without an ice cream maker was a lot of work and still yielded a pretty funky texture that works better in an ice-pops mold for sure. It froze more like paletas than frozen yogurt. Also, I added more peaches and would consider just making it with greek yogurt as it's so similar to sour cream anyway. 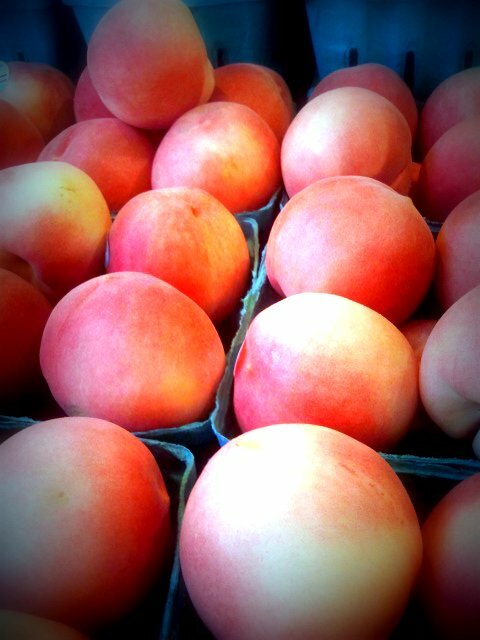 Mash up the peaches with a food processor, mixer or by hand. You could cut a little bit of one peach into chunks for that chunky whole fruit look also. Bring the fruit to a simmer in a saucepan, allowing it to cook down. As it becomes more liquid, whisk the tapioca starch into the fruit vigorously until it completely dissolves. Add 1 TBLSPN of the lemon, the zest, cardamom and all the honey. Stir well to combine. Continue to simmer the mixture for about 15-25 min; stirring every once in awhile to keep in from burning. Once the jam is hot enough, thick enough, and sticky enough, remove from heat. Stir in the lemon juice and let cool. If the jam is too thick for your liking, just add a little more water or lemon juice to the mixture.Taste it hot to see what you think of the flavor, and add more of whatever you like! I'm going to experiment with this for plum freezer jam as well, as I think the cardamom and honey would be delicious, complimentary flavors. We also made this amazing grain-free, egg-free brownie as a cake- IT IS SO GOOD!